It was exactly one year ago this week that astronomers found a brand-new planet in our solar system  a giant ball of ice and gas some 17 times the mass of Earth, orbiting the sun beyond Uranus. Ordinarily, a discovery this astonishing would have been the lead story in every media outlet in the world  but it's pretty much guaranteed that no living human heard even a rumor about the announcement. That's because we automatically think of the word year in very local terms. Technically, a year is the time it takes any planet to complete one orbit of its star. Where we live, that adds up to 365 days and change. But for Neptune, discovered in 1846, a single orbit takes a bit less than 165 Earth years  and the planet has now completed exactly one of those Neptunian years since it was first spotted by the German astronomer Johann Gottfried Galle at the Berlin Observatory. It has thus at last returned to the same point in the solar system where it was when it was first identified. 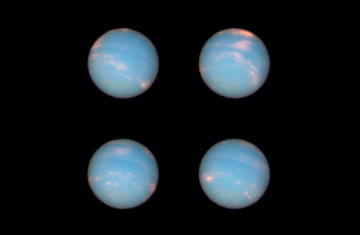 In honor of the occasion, the people who run the Hubble Space Telescope have taken a set of four anniversary photos of the big blue planet, one every four hours or so to capture a full rotation (Neptune's year may be much longer than ours, but its day lasts only 16 hours). It's now early winter in Neptune's northern hemisphere  a season that will last 40 Earth years or so. The planet's solid surface is invisible, shrouded by a thick atmosphere made mostly of hydrogen and helium. White clouds of methane ice swirl through the Neptunian air  a feature nobody expected when Voyager 2 took the first and last closeups of the planet in 1989. Neptune also has a faint ring, but it's a poor cousin to Saturn's magnificent multicolored tutu. But the way Neptune was found was perhaps even more important. Herschel had stumbled on Uranus while surveying the skies from his back garden with his homemade telescope; his genius was in building such an exquisite instrument in the first place and then in recognizing that the object he spotted was highly unusual and worthy of following up. Neptune's existence, on the other hand, was predicted. Herschel himself realized that Uranus wasn't moving quite in accord with Newton's laws of gravity, and astronomers who came after him deduced the reason: some other huge planet, not yet detected, must be pulling on it. Sure enough, the French astronomer Urbain Le Verrier calculated just where that mystery planet should be, and when Galle went in search of it, there it was. (The English astronomer Adams also predicted the new planet's location, so he's sometimes credited as one of the discoverers too.) It wasn't the first time anyone saw Neptune  no less a scientist than Galileo noted it in the early 1600s. But he thought it was just another star. All that was a big deal for science in general. Ever since Neptune's discovery, astronomers have used strange motions in objects they can see to deduce the existence of ones they can't. Dark matter, for example, the invisible stuff that dominates the mass of the universe, was first detected by its gravitational influence on visible stars. Dark energy, the force that makes the universe expand faster every year, was found by clocking the speeds of distant galaxies. We know that giant black holes lurk at the center of the Milky Way and other galaxies because stars and gas clouds are whipping around too fast to be explained by anything else. Sometimes the technique backfires. Pluto was found because there seemed to be something pulling on Neptune, just as Neptune pulled on Uranus. But while the recently demoted dwarf planet is in the right place, it is far too tiny to have any such influence. It turned out that the anomalies in Neptune's orbit weren't really there after all. Now and then, scientists can't agree on whether there's an effect or not: a couple of astronomers think some comets are moving strangely due to a still undiscovered giant planet far beyond Neptune, but most of their colleagues doubt it's true. All the same, using the visible to find the invisible is one of the most powerful tools astronomers have for understanding a cosmos that hides so much of itself from view. And the discovery of Neptune, exactly one year ago this week, marked its debut.